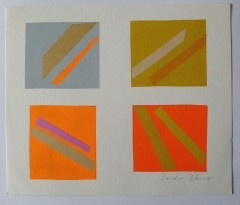 Sandra Blow- Original Prints and Rare Art books with Free Delivery. 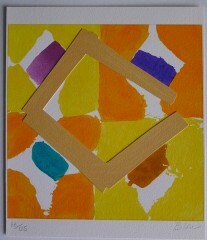 Sandra Blow was an abstract painter and print maker, born in 1925, London. She studied at St Martin’s School of Art under Ruskin Spear 1941–6 and the Royal Academy Schools 1946–7. In 1947 she travelled to Italy to study art, enrolling at the Accademia di Belle Arte in Rome for a year. It was in here that she met the Italian artist Alberto Burri, who became her partner for a few years. Blow and Burri travelled around Italy before working together in Paris. Burri was a significant influence on Blow, teaching her to work in different materials and inspiring a passion for art. Blow and Burri worked together in Paris during 1949, but they split on friendly terms, with the pair creating works in response to the other throughout the 1950s and 1960s. Blow returned to London in 1950. She had her first ‘one-man show’ at Gimpel Fils 1951and she produced works regularly. 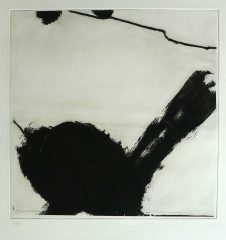 In 1960, she started teaching painting at Royal College of Art in 1960. She was awarded the Second Prize for Painting at the John Moores Liverpool Exhibition 1961.She lived in St.Ives having to leave London due to rising rent.